(1) Who is one of your relatives (ancestor or not) who behaved poorly during his or her life? It can be any time period. 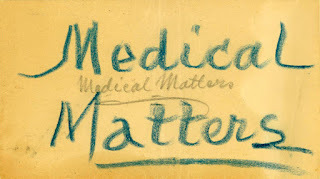 (2) Tell us about it in your own blog post, in a comment on this post, or in a comment on Facebook or Google+. I guess I've been pretty fortunate. So far I have not found many members of my family who behaved poorly, or if they did, I haven't found the evidence yet. When Randy posted this theme a year and a half ago, I wrote about the really bad relative I know of, Joseph Mulliner, who was hung for treason after the Revolutionary War. It's hard to behave more badly than treason. I suppose my fugitive great-grandfather, the biological father of my paternal grandfather, might quality as a "bad behavior" relative. Until I figure out who he is, however, and then try to determine whether he even knew that my great-grandmother was pregnant, I can't indict him for not being around. That wouldn't be fair. If I focus on "bad behavior" rather than criminal acts (such as treason), one person does come to mind. I can't really name names, as descendants are still alive, but I can describe her behavior. 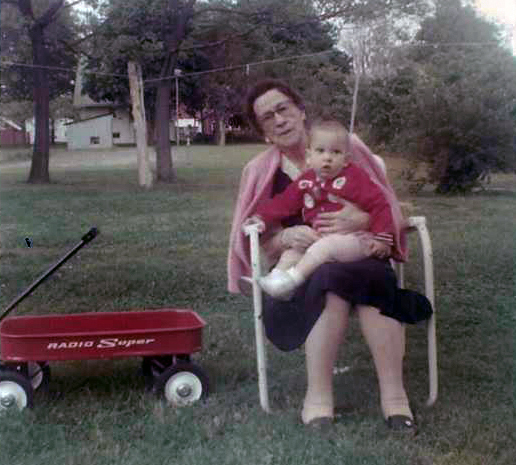 I never met my grand-aunt, who died in 1980, but I heard stories about her when I was young. Her daughter was unable to bear children of her own, so she and her husband adopted a son. My grand-aunt always made a pointed distinction between how she treated her adoptive grandson versus the biological grandchildren she had. Decades later, when I met the grandson, he confirmed the stories I had heard. It was obvious the pain still lingered. The daughter mentioned above later had cancer. Even though she was ill and nearing the end of her life, my grand-aunt used to order her around and demand that the daughter cook for her. I was fortunate to meet my grand-aunt's son on a trip to New York. He did not go into detail, but he did confirm that the woman was unpleasant to pretty much everyone and treated people poorly. He apparently had nothing good to say about her so kept what he said to a minimum. I don't know how she treated her father, but his will shows that he wasn't a big fan either. Bequests to his other children were each several hundred dollars, while he left her only $25. 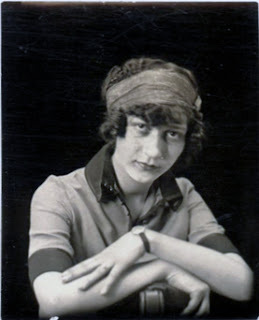 At the end of the will, after having designated several bequests to charitable organizations and the like, he stated that the residue of his estate was to be divided evenly among all of his children — except for this grand-aunt. Overall, there seems to have been a lifetime of "bad behavior." If she had any positive traits, no one seems to have remembered them to pass on that information. 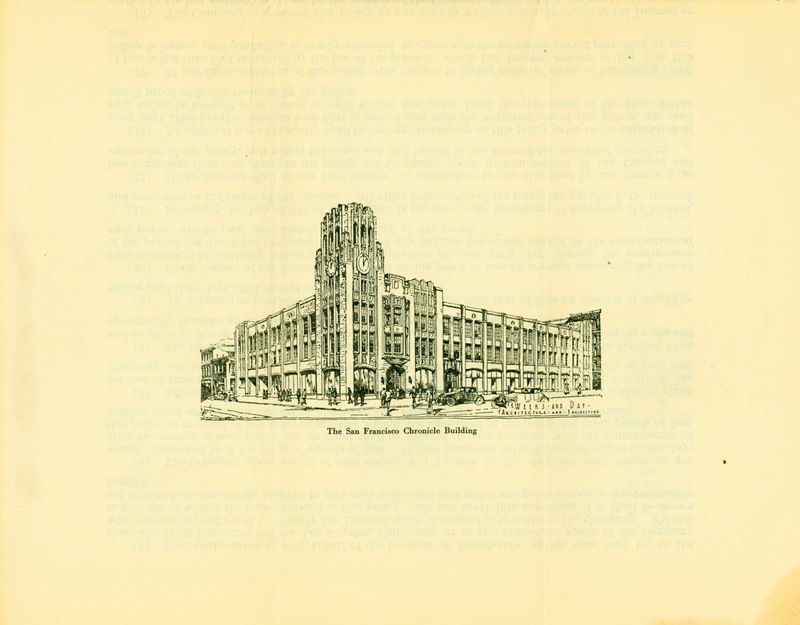 On the weekend of March 4–5, 2017, the City and County of San Francisco Office of the Mayor, Non Plus Ultra, and dozens of local history groups will open the Old Mint, at 88 Fifth Street, for a free community open house, San Francisco History Days 2017 (http://www.sfhistorydays.org/). A National Historic Landmark, the classical building at 88 Fifth Street was a branch of the United States Mint from 1874 to 1937. For the San Francisco History Days weekend, the counting rooms and brick vaults of “The Granite Lady” will come alive with dozens of organizations offering history displays, activities, tours, and presentations. Join community historians, archivists, representatives of indigenous communities, genealogists, archaeologists, researchers, educators, re-enactors, authors, and filmmakers for this event on Saturday, March 4, from 11:00 a.m. to 5:00 p.m., and Sunday, March 5, from 11:00 a.m. to 4:00 p.m. Highlights of the weekend include presentations on local architectural, transit, neighborhood, and maritime history; exhibits addressing the Summer of Love 50th anniversary; displays of neighborhood and community archives; and a resource center with information about history organizations, homes, and educational centers around the Bay Area. Mini theaters and galleries will be set up in the ground floor vaults of the Old Mint over the weekend, featuring found footage, film features, and rare and newly digitized photos. Dozens of authors will be on hand to discuss and sell their books on local historical themes. 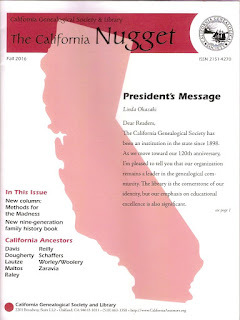 And there will be a joint presentation on family history by the San Francisco Bay Area Jewish Genealogical Society, the California Genealogical Society, and SFGenealogy. San Francisco History Days began in 2016, based on previous events at the Old Mint and organized by a collective composed of historians from Bay Area organizations, the Office of the Mayor, and the current tenants of the Old Mint and event underwriter, Non Plus Ultra. The event's aim is to celebrate and share the history of San Francisco and the Bay Area. The 2016 San Francisco History Days weekend attracted more than 6,500 visitors. The event still needs volunteers! Please consider donating a few hours of your time. For information on how to volunteer, e-mail participate@sfhistorydays.org as soon as possible. 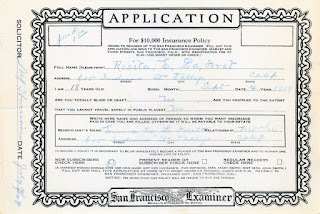 For general information on the event and to see a list of participating organizations, visit http://www.sfhistorydays.org/ or write to info@sfhistorydays.org. I am really surprised how quickly time has passed since RootsTech ended. I planned to post about it right after the conference, but somehow a week and a half has slipped by while I've been catching up to my regular life. This year's experience was quite a bit different from when I attended two yeas ago. That year the FGS conference was held in conjunction with RootsTech, which worked out well for me, because three quarters of the sessions I attended were FGS ones. I found the vast majority of the RootsTech sessions so basic that I didn't feel I would learn anything from them. Being a speaker this year was the biggest difference, of course. I had to pay much more attention to the time on the two days of my talks! (I'm glad both were in the afternoon, as I'm not much of a morning person anymore.) I'm happy to report that both talks went well, with good questions from attendees and many thank yous for the helpful information. I was even interviewed about my classes for the RootsTech Facebook page! One negative aspect of the conference was like "déjà vu all over again." My talks (on Freedmen's Bureau and Freedman's Bank records), along with almost all other presentations that were part of the Africa-focused research that was heavily promoted this year, were in the very, very, very far end of the Salt Palace, closer to the Family History Library than to the main hub of activity for the conference. (This is where the FGS talks were in 2015. I joked then about FGS being the red-headed stepchild.) That meant that none of the talks (that I know of) had as good attendance as they should have. It isn't as though there aren't appropriately sized rooms closer to the main hall that could have accommodated our sessions. And I'm not the only person who has commented. One has to wonder why FamilySearch would market African Heritage Day so much and then put the classes that supported it so out of the way. 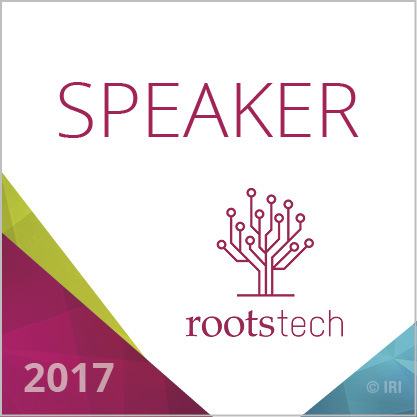 Another thing that was (happily) different this year was that several RootsTech sessions were actually geared for intermediate and more experienced researchers. I found quite a few presentations to attend and learned a fair amount. By far my favorite speaker during the conference was Myko Clelland of FindMyPast.com. I missed his first talk — on the British Newspaper Archive collection on FMP — but I did attend his talks on British crime and punishment records and on British research beyond the census. He was knowledgeable, entertaining, and a great presenter. I never did figure out what he thinks is so difficult to pronounce about his name, however. Another standout session, primarily because of my own presentation on the same subject, was the talk by FamilySearch's Ken Nelson on Freedmen's Bureau records. 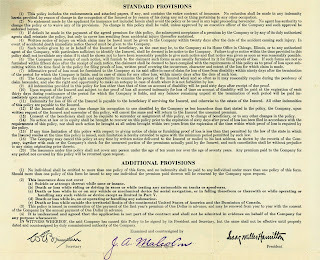 He was the coordinator of the Freedmen's Bureau digitization and indexing project for FamilySearch, and he explained how he assessed the records and decided which ones would be prioritized for the project. This helped me understand what is and is not indexed and why, and I've been able to share the information with others. I also learned a lot in Bernice Bennett's session on the Southern Claims Commission. Hers was the best talk I have heard on this subject. I feel much more comfortable now with beginning my research into these records. 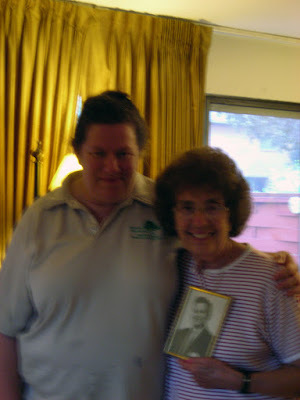 I had a great time meeting and networking with other genealogists. Not only did I get together with other genealogists about potential future projects, I saw people I know leaving behind-closed-door meetings. Lots of business was going on at the conference, on many levels. Unfortunately, not everything was good. Besides the "afterthought" location of the black genealogy programming, one major bone I had to pick with the conference was the decision to make handouts available only via the app. I don't have a smartphone, which meant I didn't get to have handouts. And the handouts for my sessions weren't even available through the app when I taught my first class! I guess this is RootsTech's way of saying that if you don't have a smartphone, they don't want you to bother coming to the conference; you are not their target market. The only place I could find information about this policy was buried near the bottom of the FAQ online, though I freely admit I may have missed it somewhere else. Personally, I think this is shortsighted of FamilySearch, but my opinion carries no weight. My other big beef with the conference is the large number of sessions presented by company employees that weren't always clearly noted as such. 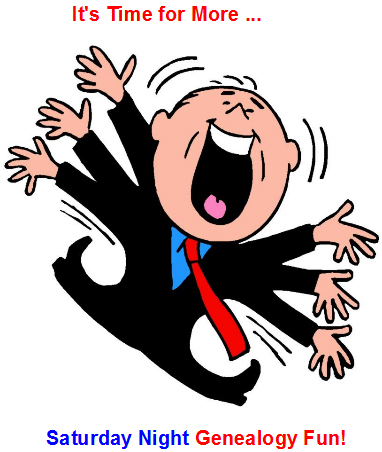 I think every talk that is essentially advertising for a company's site and/or services should be marked as "vendor session" in the program. Then at least you know what you're in for. I was so busy at the conference, I had hardly any time for the Family History Library. I did get over there for a few hours to work on my Mundy research, in my search for my grandfather's biological father. I didn't make huge progress, but every little bit helps. Notwithstanding the problems I experienced at the conference, overall I had a great time, and I'm very happy I was able to attend. I hope my talks were reviewed well by attendees, and maybe I'll have presentations accepted next year on my own merits. 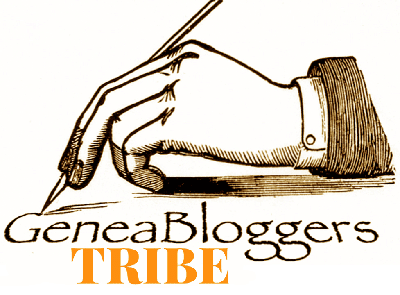 Treasure Chest Thursday: Another Insurance Policy, Another Trip for Rosita? 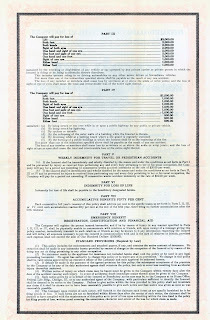 This 9" x 6" piece of off-white paper is a carbon copy of another insurance policy for Rosita E. La Foret. As with last week's policy, the cost was $1.00, noted as paid in the upper left corner. 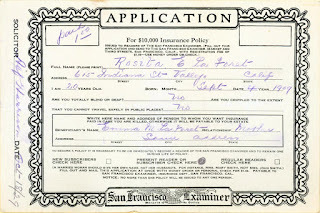 The date on the form is October 18, 1929, and Rosita was 20 years old. 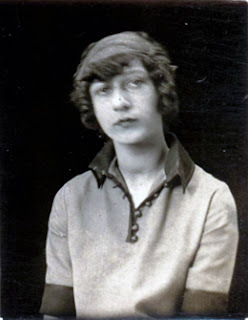 Her birthdate is noted as September 4, 1909, and she again responded "no" to the questions asking whether she was totally blind or deaf, or crippled to the extent she could not travel safely in public places. The beneficiary was Rosita's mother, Emma M. La Foret. They both resided at 615 Indiana Street, Vallejo, California. 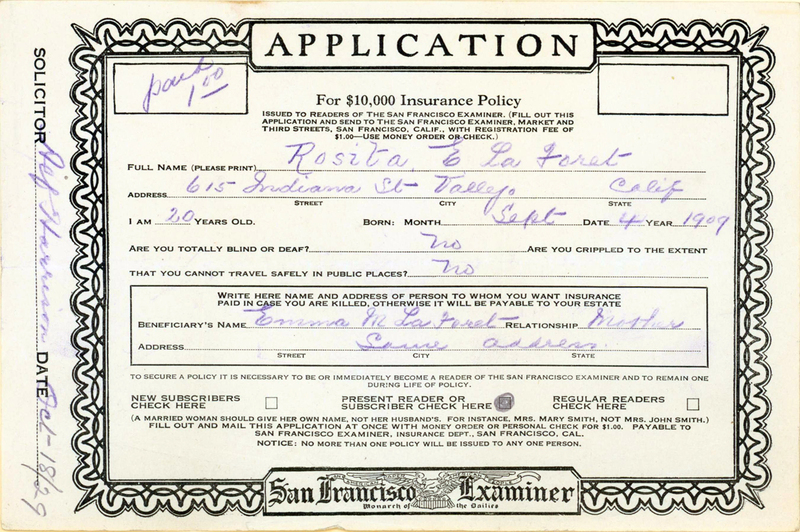 This form indicates that Rosita was a present reader or subscriber of the San Francisco Examiner, whereas the previous year she had been a new subscriber. 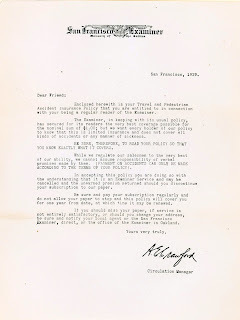 The "solicitor" (salesman, I presume) who sold the policy was Alf Harrison. 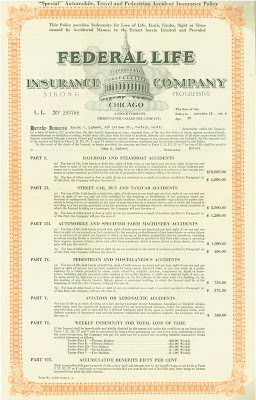 The insurance policy paper, while similar to that from last week, is not as detailed. 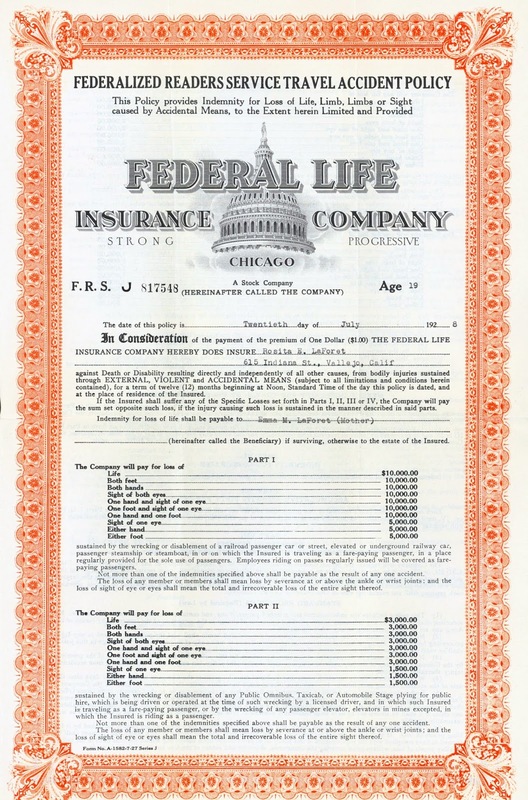 It is only 11 7/8" x 18 3/4", about half the size of the previous two policies, so designed to be folded in half and then thirds. It varies between off-white and yellowish and has some greasy-looking stains. 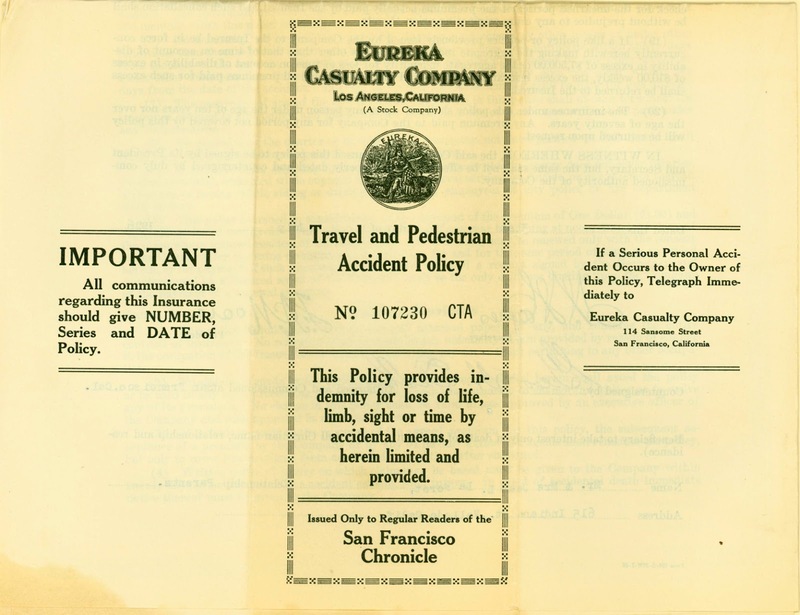 This is a "SPECIAL Automobile Travel and Pedestrian Accident Policy." I wonder how "special" differs from "federalized." Again, almost everything on this policy is preprinted, including the signatures on the back page. The date; Rosita's name, age, and address; and Emma's name and relationship as beneficiary are typed. This policy doesn't even have the added contact information that last week's example did. 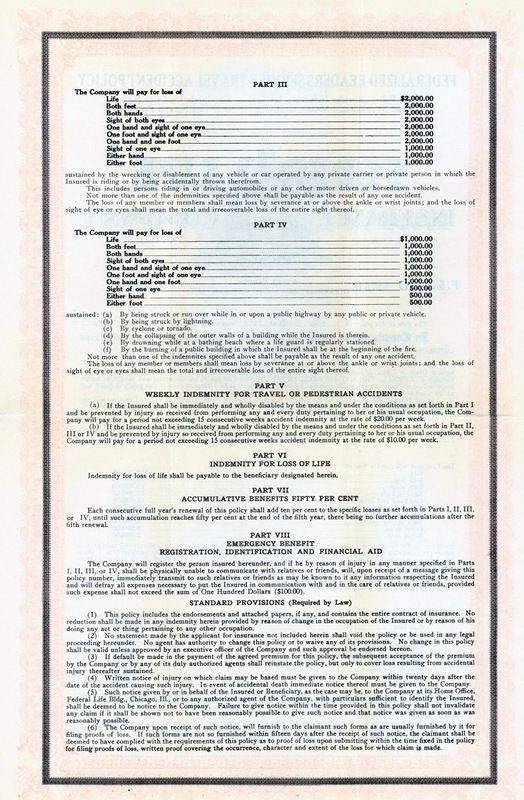 The compensation amounts in this policy don't have as much detail or variety as those in the 1928 policy, and the payment amounts have generally decreased. 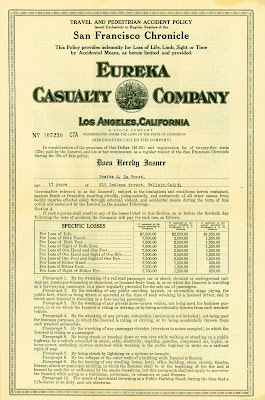 Now there are six categories of injuries, with the top payments being $10,000 and $4,000 (instead of 1928's $5,000 for the lower payment). These were for an injury in a railroad or steamboat accident. 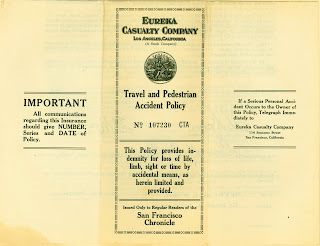 The lowest payments, $750 and $375 (down in amount from $1,000 and $500 in 1928), were for injuries during a pedestrian or miscellaneous accident. 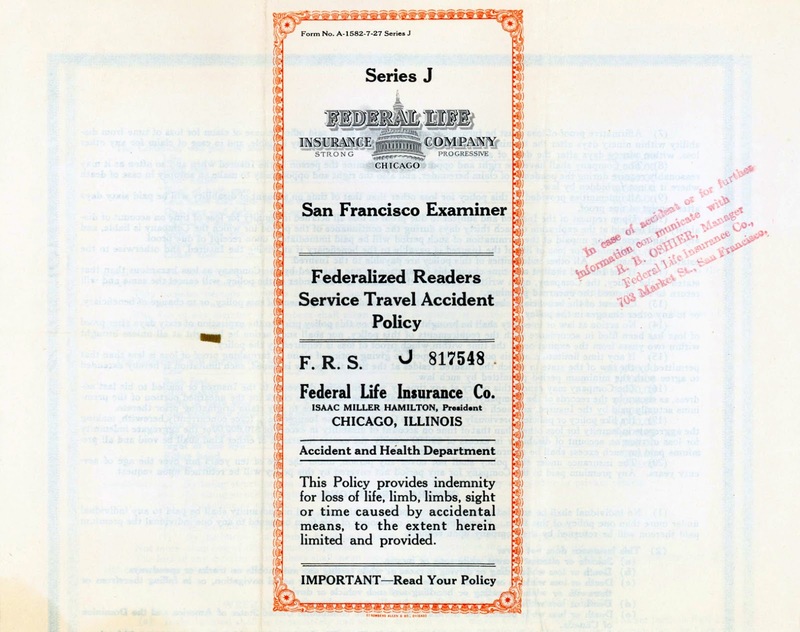 This is another policy from the Federal Life Insurance Company of Chicago, so the Examiner had not changed its affiliation during the past year. 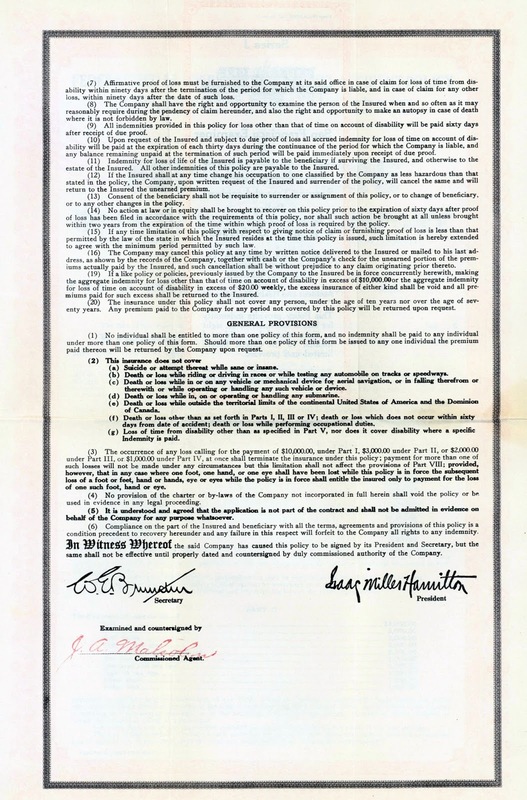 The policy came with the standard acknowedgment letter, on an 8 1/2" x 11" off-white piece of paper, about 20# bond in weight, no watermark. It is word for word exactly the same as that from 1928; even the sentence lengths are the same. It's the same letter. The only difference is the year in the upper right of the page. Even the signature of the circulation manager looks the same, but this one has no texture and appears to have been printed. 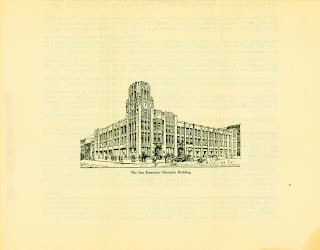 Since it looks exactly the same as the one from 1928, I now suspect the earlier one was probably printed; I don't know where the texture came from. Because this is the same letter, the Examiner still doesn't trust its salesman. There's also the same conflicting information about being able to hold a policy as a reader but the admonition to keep one's subscription paid up. 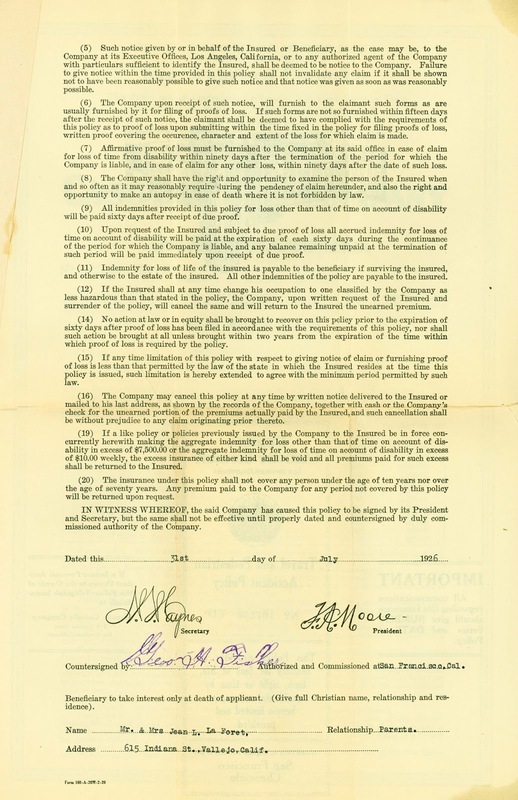 This policy was written on October 19, 1929. Less than a week later, on October 24, came the Stock Market Crash of 1929, which marked the beginning of the Great Depression in the United States. I wonder how much the policy was worth at that point? At least the company survived. Surprisingly, this is the last document I have for Emma. The only items pertaining strictly to her were three insurance policies. Now I have to decide who to look at next. Yes, I still have lots of documents left! This is a 9" x 6" off-white piece of paper. It is a carbon copy of an application for a $10,000 insurance policy for Rosita La Forêt. 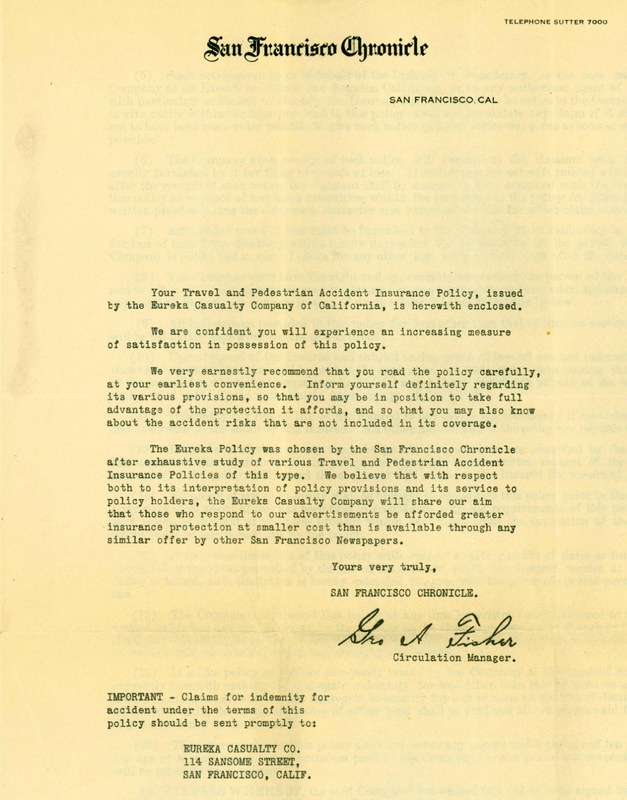 The policy cost $1.00, indicated as paid. 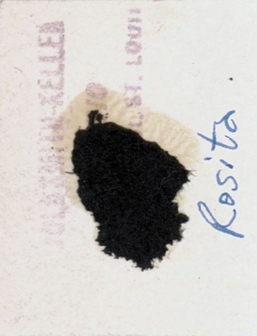 Rosita was 18 years old and still living at 615 Indiana Street, Vallejo, California. Her birth date was given as September 4, 1909, which matches that on the emergency passport application her mother filled out in 1917. 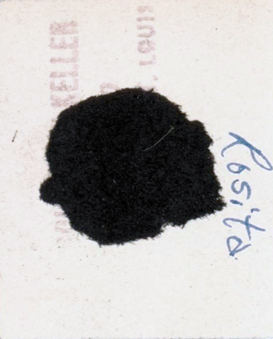 The application included questions asking whether Rosita was totally blind or deaf (no), or crippled to the extent that she could not travel safely in public places (no). 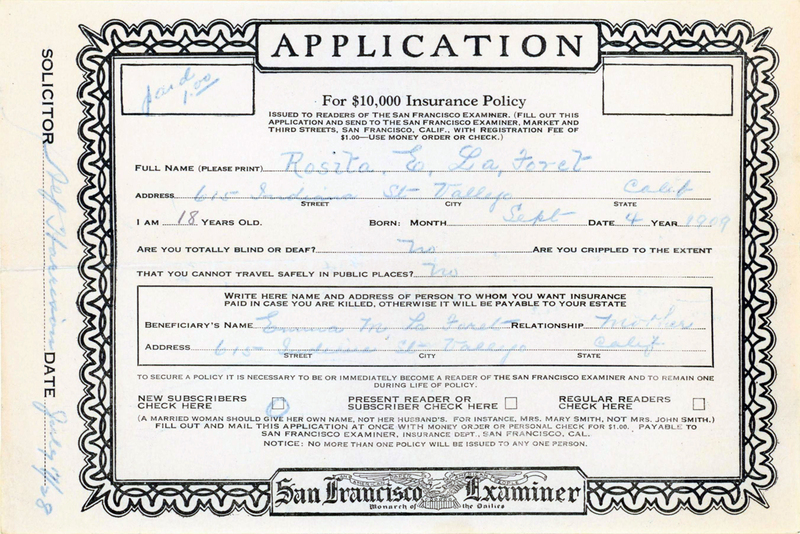 The application was dated July 7, 1928. This time the only beneficiary named was Rosita's mother, Emma La Forêt. 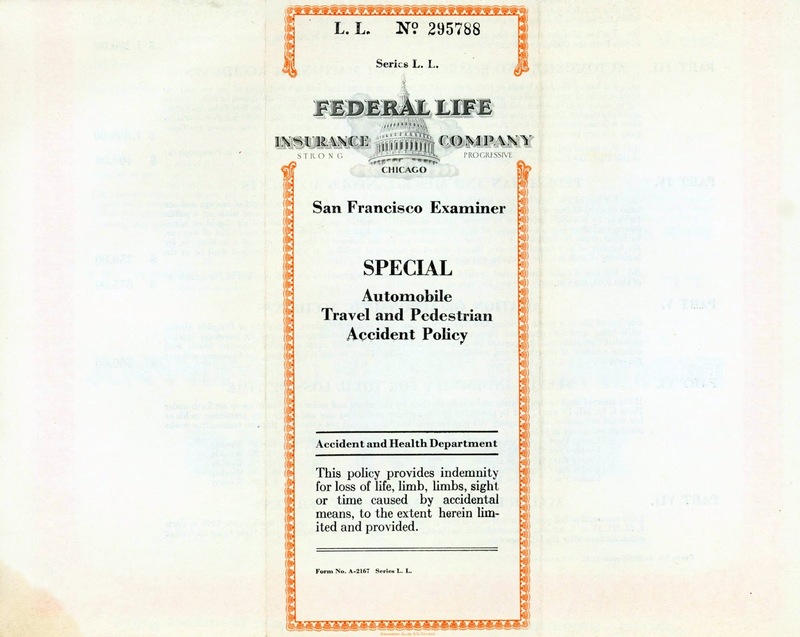 Jean La Forêt had died shortly after the date of the insurance policy I posted last week. Now that this has surfaced, one item that Emma saved makes a little more sense. 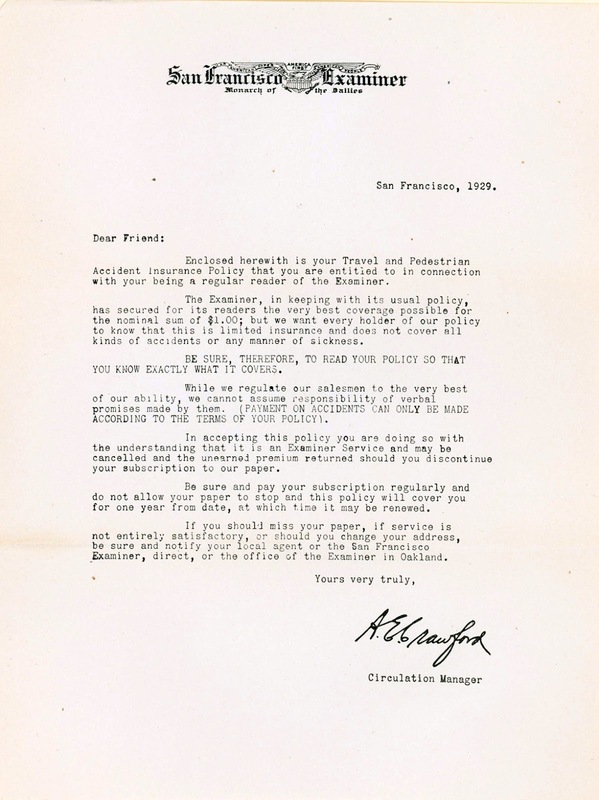 On July 17, 1928, Emma bought a subscription to the San Francisco Examiner. When I posted about that, I wondered why she would have bothered to keep such an apparently inconsequential item. 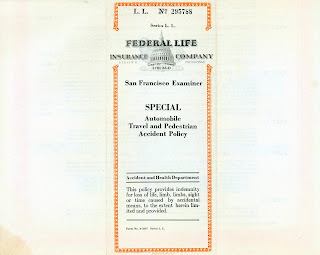 Even though this insurance policy was available to readers of the Examiner, as was last week's policy through the Chronicle, the fact that the subscription and the policy are dated on the same day may mean that Emma had simply kept the paperwork together. 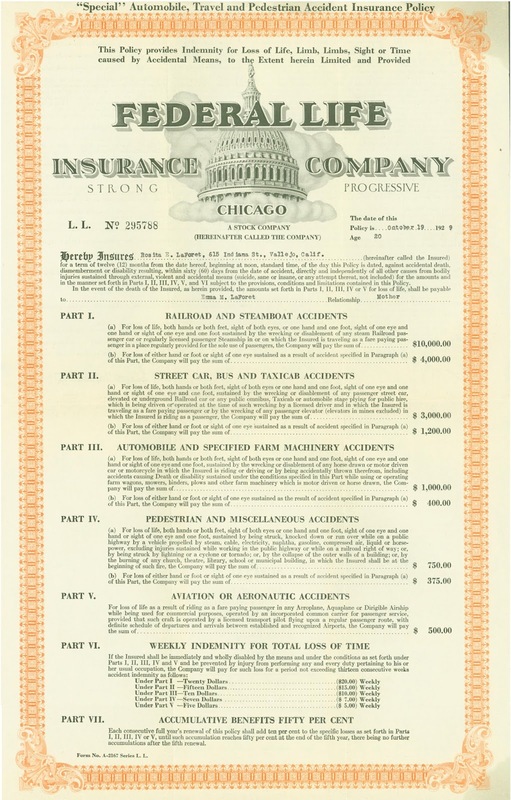 The insurance policy itself is similar to that in last week's post. It is again 22" x 17", designed to be folded into quarters and then thirds. The scan is close to the paper's true colors, an off-white with some color on it. 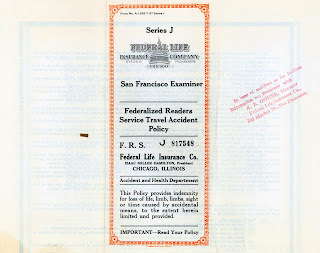 It is labeled as a "Federalized Readers Service Travel Accident Policy." Almost everything on this policy is preprinted. The exceptions are the stamped contact information on the front in red; and the date, Rosita's name, age, and address, and Emma's name as beneficiary on the "title" page. 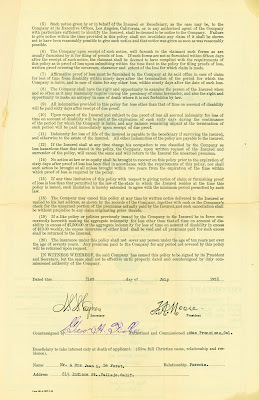 On this policy the signatures on the the third page appear to have been printed with the policy, not stamped on it later. As with last week's insurance policy, no specific reason or travel is indicated, so we don't know why Rosita was being insured. The details about compensation are similar to those in the previous policy. 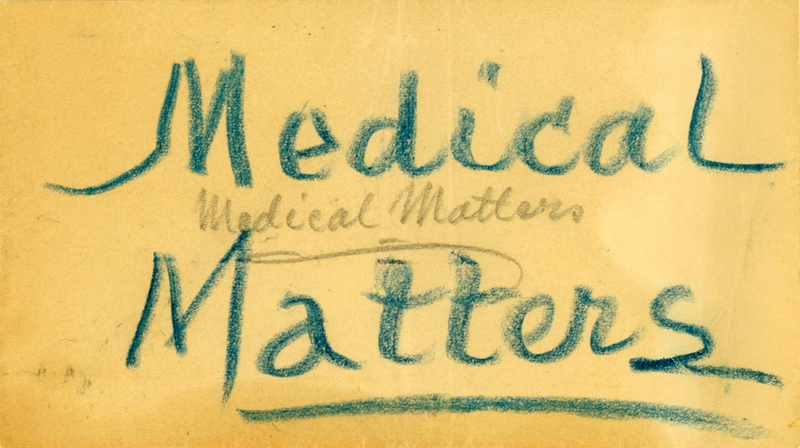 Payment amounts are higher than those from 1926 — $10,000 and $5,000, as opposed to $7,000 and $3,500 — at least for the first classification of injuries. This policy has four different levels, however. The distinctions are based on how the injuries were sustained. The lowest payments went down to $1,000 and $500. So if Rosita had been injured during the "wrecking or disablement of a railroad passenger car" while she was traveling on it as a "fare-paying passenger", she would have been eligible for the highest category. On the other hand, an injury via lightning, cyclone, or tornado fell into the lowest category. 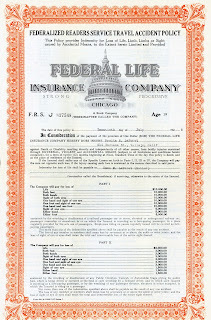 This policy was from the Federal Life Insurance Company of Chicago. 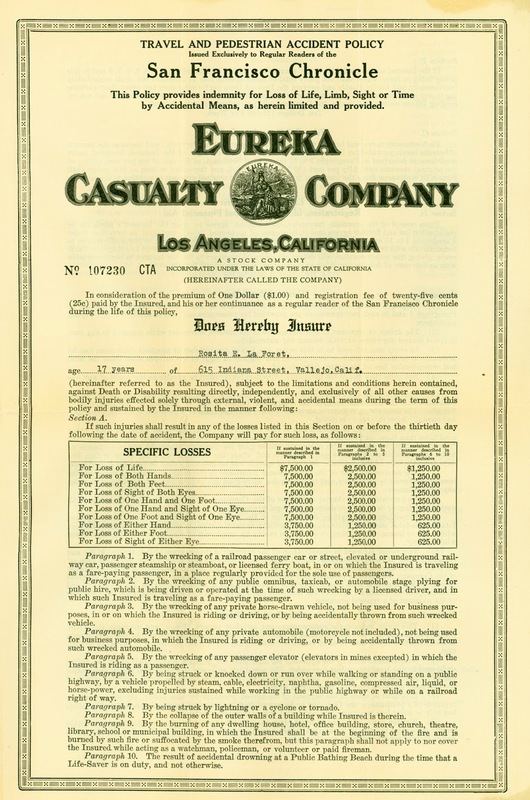 The company is still in business today, unlike good old Eureka Casualty Company from last week, although it is now in Riverwoods, Illinois. 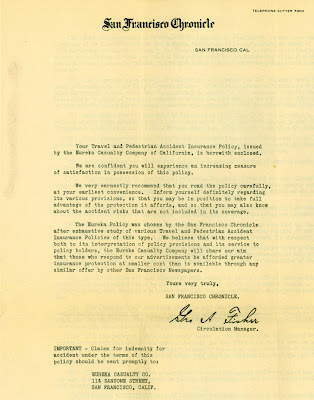 The policy also came with a formulaic acknowledgment letter. It is on an 8 1/2" x 11" off-white piece of paper, about 20# bond in weight, with no watermark. It was printed. 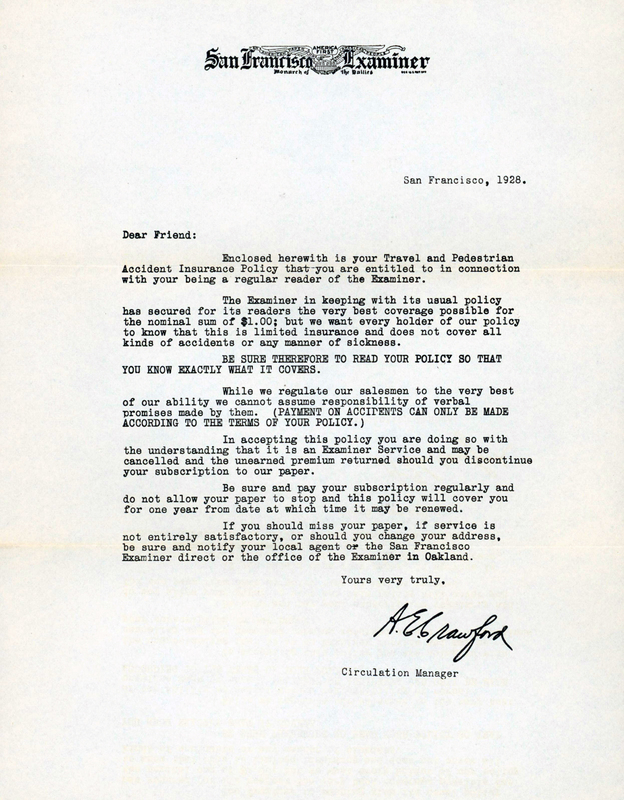 The signature has some texture and is significantly darker than the typed letter; it might be real. The letter was not glued into the policy but was loose. This is another fairly standard letter, but the Examiner doesn't seem to have entirely trusted its salesmen. Why else would it be necessary to include the disclaimer that it could not "assume responsibility of verbal promises made by them"? 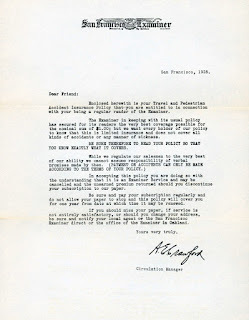 There's a slight conflict in some of the information in the letter. 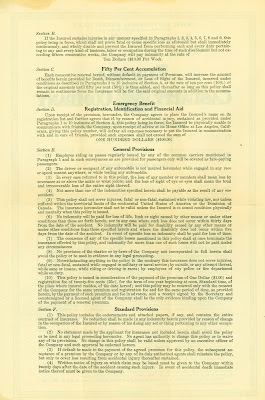 The first paragraph states that a regular reader was entitled to a policy, and the application form includes readers as a category, but the next-to-last paragraph has "Be sure and pay your subscription regularly and do not allow your paper to stop and this policy will cover you for one year . . . ." Maybe that was just a marketing tactic to try to keep subscribers? Some of us were focused on genealogy! In fact, I was at the Sacramento Public Library talking about using Freedmen's Bureau records, specifically focusing on the recently digitized and indexed version available on FamilySearch.org and searchable through DiscoverFreedmen.org. And we actually had about 40 people show up! Now remember, these records are extremely important for black family history research because they are the contemporary primary source that indicates the last owner of a formerly enslaved individual. 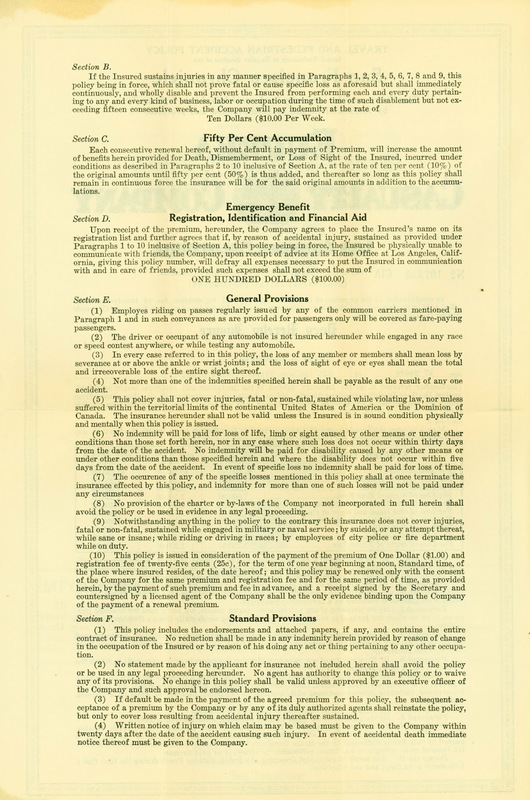 In many of the records created by the Freedmen's Bureau, one of the questions asked was "What was the name of your last owner?" 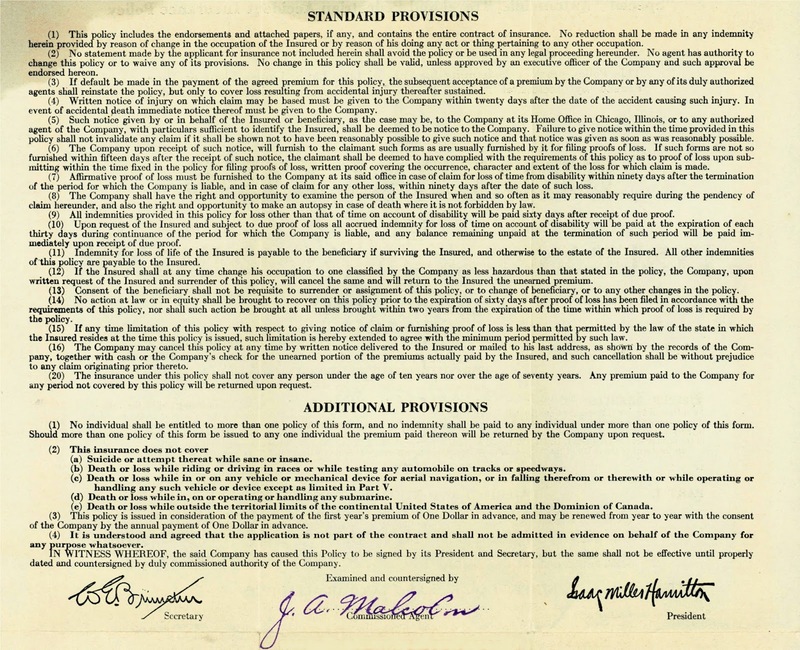 That owner's name is critical to finding more information about the individual prior to Emancipation. Another problem is that the National Archives microfilms of the Bureau records had the records sorted by state. Now all the labor contracts are in one “United States” database, and the same for school records, hospital records, etc. 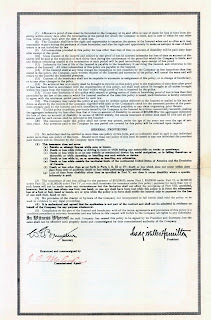 So if the state that the freedman was living in didn’t actually appear on the record but another state did (and yes, some of the records are like that, like a contract where the person hiring is in a different state), that record will only appear under the second state, not the one that the person was living in. Most of the time a researcher isn’t going to check a record that lists the wrong state, so that’s a bunch of people who are now harder to track down. There are also problems where the location listed on the index is not that on the record. So someone might be in Plaquemine Parish, Louisiana, for example, but the index says New Orleans. This is another situation where a researcher probably wouldn't look at that record. Something else that hasn’t been publicized well is how the search works now for the records. If you go directly to FamilySearch.org, as I did at first, you will need to search through each database individually. If you go to DiscoverFreedmen.org, the very, very basic search on that page — which allows you to input only first and last names, so it looks next to useless — actually searches all 15 indexed databases at once, which is a good thing. But don’t pay attention to the short list of 20 results you’ll see on the DiscoverFreedmen page. Click the link that says it will show you all the results. That will take you to FamilySearch.org, and along with the option to see more than 20 results at a time, you’ll get to see which databases the results came from. You can delete databases if you don’t think the locations will be relevant, but considering the whole location problem discussed above, do so with caution. And yet another problem with the index: From the beginning, the instructions given to volunteers were not to transcribe every name on a record. Yes, someone decided that Bureau employees weren’t worthy of being recorded, and some other people’s names also were not included in the index. So the index is not really an every-name index for these records. The good news is that even a flawed index is better than no index, and the Freedmen’s Bureau records are far more accessible than they used to be. But the flaws need to be understood so that researchers will know when not to put all their faith in that index. 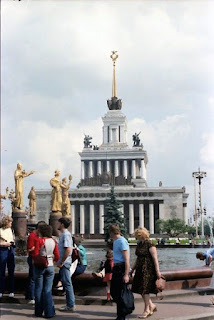 For some additional pointed commentary on the new search, see this post on Nicka Smith's blog. (1) Use the Facebook "Learn about Each Other" meme being passed around this week and answer the 32 questions as listed below. So here are my answers. I copied Randy's blue, even though I hate the HTML. I noticed that Randy's list had no 5, 27, or 28, so I looked on Facebook and discovered multiple variations of the meme (no surprise there). I found a question 5 I liked and added that, and my cousin had the question 20 I've used. So mine is actually a list of 31 questions, whereas Randy has only 29! 1. Who are you named after? I was named for my two Jewish great-grandfathers, following the Ashkenazi tradition to name children after deceased relatives. My mother used the initials: Janice is for Joyne (Gorodetsky), and Marie is for Moishe (Meckler). 2. Last time you cried? A few days ago watching a sob story on the news. 3. Do you like your handwriting? Not as much as I used to. I used to write in a beautiful cursive, but I seem to be getting sloppy in my middle age. 4. What is your favorite lunch meat? Genoa salami. 5. Spicy or sweet? Spicy, every time! 6. Longest relationship? Father, uncles, and aunts: almost 55 years. 7. Do you still have your tonsils? Yes. 8. Would you bungee jump? Hell no. 9. What is your favorite kind of cereal? Hot: Cornmeal mush with sugar and whole milk. Cold: Lucky Charms with whole milk. 10. Do you untie your shoes when you take them off? Yes, almost every time. 11. Do you think you're strong? Physically: Not really anymore (work injuries). Emotionally: Yes, most of the time. 12. Favorite ice cream? Ben & Jerry's Coffee Coffee Buzz Buzz Buzz; almost anyone's Mint Chocolate Chip. 13. What is the first thing you notice about a person? Hair, face, eyes. 14. Football or baseball? Both, but football a lot more. 16. Last thing you ate? Ferrero Rocher hazelnut chocolate. 17. What are you listening to? The TV in the bird room, which is currently airing Sesame Street on PBS Kids. 18. If you were a crayon, what color would you be? Royal Blue. 19. What is your favorite smell? Maybe frying bacon, even though I don't like to eat it very much. 20. Who was the last person you talked to on the phone? My friend Vernester. 21. Are you married? No. 22. Hair color? Medium brown with shots of gray. 23. Eye color? Brown (I'm full of it up to there). 24. Favorite foods to eat? Rare steak, shrimp, scallops, crab, mango, sushi. 25. Scary movies or happy endings? Scary movies. 26. Last movie you watched? Wild Kratts: A Creature Christmas with my birds. 27. What color shirt are you wearing? White and brown aloha shirt. 28. What is your favorite holiday? Passover/Pesach. 29. Beer or Wine? Yes! To be more specific, my favorites are Guinness and Gewürztraminer. 30. Night owl or morning person? Now night owl, but I was an absolute morning person until a few years ago. 31. Favorite day of the week? Friday, for Grimm and Sleepy Hollow, or Tuesday, for NCIS and NCIS: New Orleans. If you feel like contributing your answers, feel free to post them as a response to my list! 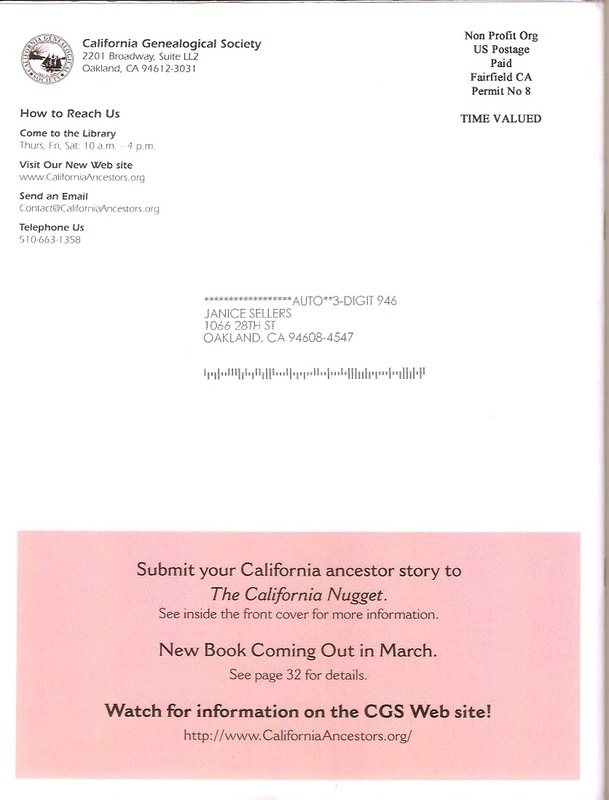 Today in the mail I received my first issue of The California Nugget for which I was the editor. I'm so excited!! I hope everyone enjoys it! 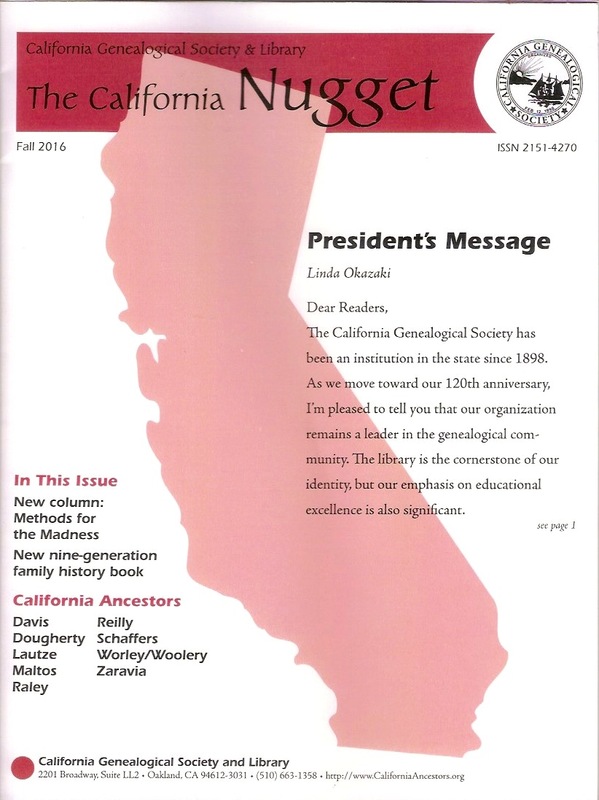 (It will be sent automatically to subscribers and to members of the California Genealogical Society.) Send me feedback! Thanks to my great team: Stacy L. Hoover, assistant editor; Nancy Cork, proofreader; and Lois Elling, compositor. And to Linda Harms Okazaki for inviting me to be the new editor.